NZD is releasing Producer Price Index and there is no economic reports in the US for today. The support rests in 0.71650 with resistance at 0.71890 which the monthly pivot point at 0.71810 is located in between the lines. The EMA of 10 is moving with bearish bias along the descendant channel and it has already reached the EMA of 200; they are both below the EMA of 100. The RSI is rising towards the 50 level, the MACD indicator is in positive territory and the Stochastic is moving in low ranges. The ADX is showing a buy signal. The price is below the Ichimoku Cloud and the Chinkou Span. The Tenkan-sen is showing downward trend while the Kijun-sen is showing a horizontal trend. 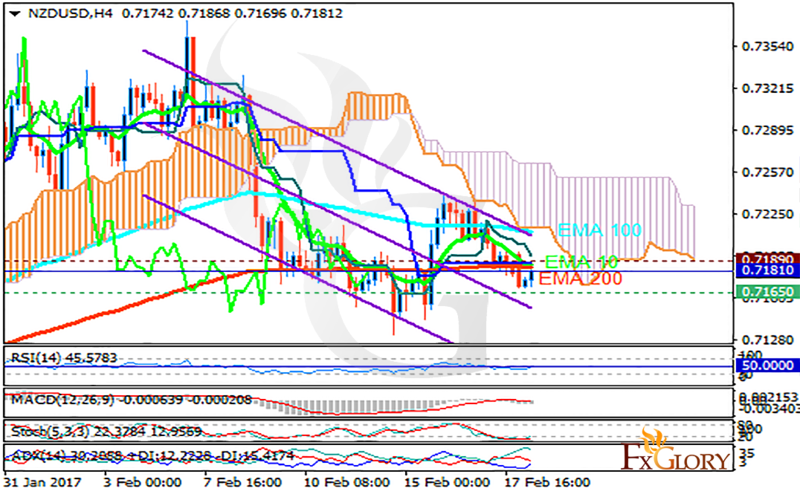 The resistance level breakout will smooth the way for further growth targeting 0.7250, otherwise it will drop to 0.7100.